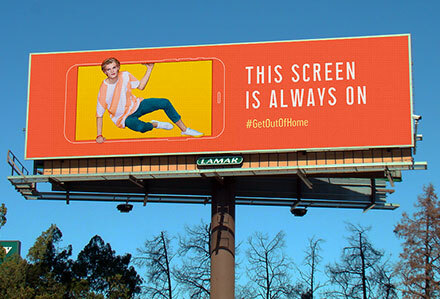 For the next month, Lamar will feature creative from the “Get Out of Home” campaign on nearly 1,000 of its digital billboards across the country and on 22 static billboards in Austin, Chicago, Dallas, Detroit and Seattle. Nationwide the campaign is being featured on more than 50,000 OOH units, including 27 digital screen networks, in 30 major U.S. markets. The “Get Out of Home” campaign creative running on Lamar’s billboard inventory in Seattle. 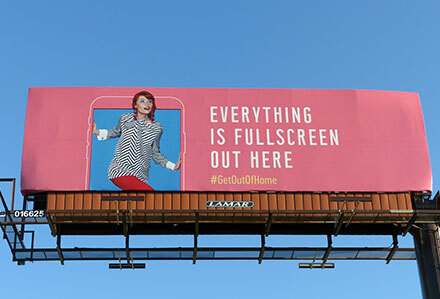 Lamar dedicated space on nearly 1,000 digital billboards across the U.S. in support of the “Get Out of Home” campaign. Josh Horn, Creative Director, Publicis New York, commented, “OOH has become the ultimate stage for brands to get their message seen. It’s contextual, measurable and responsive. We wanted to celebrate its power to amplify today’s best campaigns." The Outdoor Advertising Association of America (OAAA) is the national trade association for the $7.8 billion US out of home advertising (OOH) industry, which includes digital out of home (DOOH), and is comprised of billboards, street furniture, transit advertising, and place-based media. Comprised of 800+ member media companies, advertisers, agencies, ad-tech providers, and suppliers that represent over 90 percent of the industry, OAAA is a unified voice, an authoritative thought leader, and a passionate advocate that protects, unites, and advances OOH advertising in the United States. OAAA-member media companies donate over $500 million in public service advertising annually. Every year, the industry celebrates and rewards OOH creativity via its renowned OBIE Awards (obieawards.org). For more information, please visit oaaa.org. Lamar Advertising Company today announced that Sean Reilly, CEO of Lamar Advertising Company, is scheduled to participate in a question-and-answer session at the Goldman Sachs 27th Annual Communacopia Conference in New York, NY on Thursday, September 13, 2018. Lamar Advertising Company (Nasdaq: LAMR), a leading owner and operator of outdoor advertising and logo sign displays, announces that its board of directors has declared a quarterly cash dividend of $0.91 per share payable on September 28, 2018 to stockholders of record of Lamar’s Class A common stock and Class B common stock on September 14, 2018.